Stock status is current as of 4/21/2019 2:40 PMET. Mellanox's LinkX active optical cables are a cost-effective solution for high bandwidth fabrics, extending the benefits of Mellanox's high-performance InfiniBand and Ethernet adapters and switches. 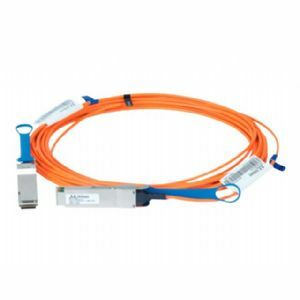 Mellanox QSFP+ cable is an assembly of 4 full-duplex lanes, where each lane is capable of transmitting data at rates up to 28Gb/s per direction, providing an aggregated rate of 100Gb/s. Mellanox certified cables are 100% tested on Mellanox's equipment to ensure interoperability and the best end to end performance. Mellanox's active optical cables are designed to create the smallest environmental footprint, and complying with class-4 QSFP+ power consumption requirement.